Following bellow is attempt to reproduce Hans de Goede blog entry at http://planet.spice-space.org/ on Ubuntu 12.04 and 11.10 with intend to build Qemu-kvm 0.15.1 with usb redirection network support per http://planet.spice-space.org/ via git repository git://people.freedesktop.org/~jwrdegoede/qemu. Spice-Gtk-0.7.81 has been built up on current snapshot of git://anongit.freedesktop.org/spice/spice-gtk to obtain Spice-Gtk with usb redirection support working stable with Spice 0.10.0. 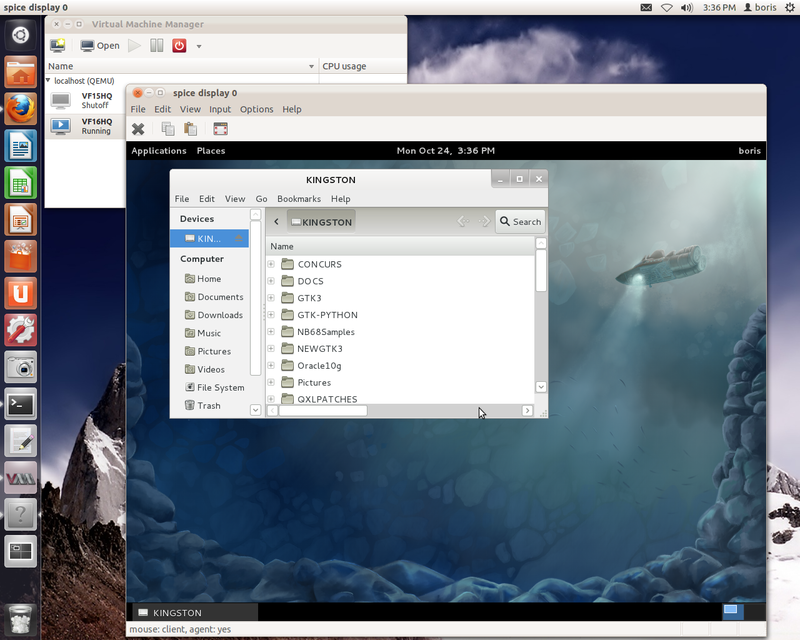 Builds have been done on Ubuntu Precise and Oneiric as well.Packaged version version of Spice-Gtk-0.7.81 is built up on mentioned git repository. 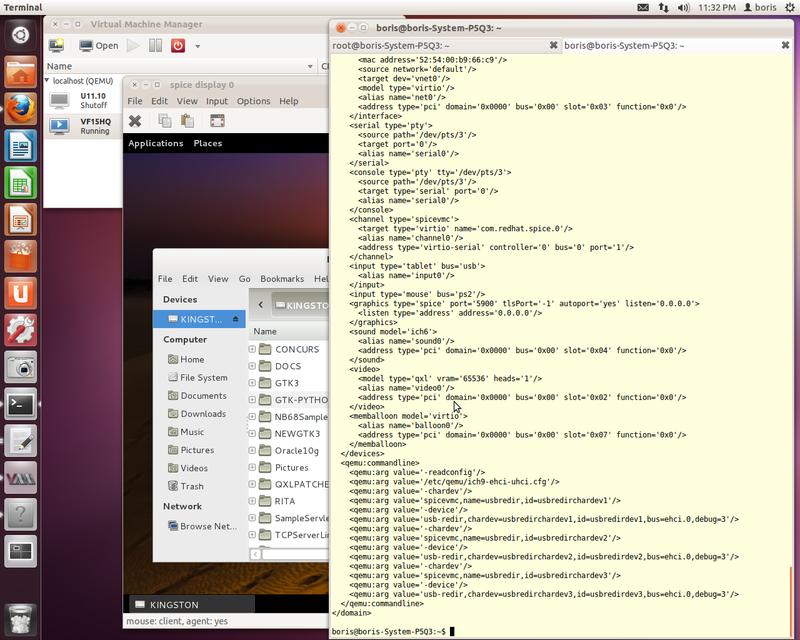 Running autogen.sh with exported environment variable NOCONFIGURE allows to perform it in one build per Debian’s Spice-Gtk-0.7-3 building schema, however requiring several updates to debian/control and debian/rules due to snapshots have to be done from current git tree.Upgrade version of Libvirt up to 0.9.7-2 allows to avoid using “qemu” command line (libvirt 0.9.2) and follow http://planet.spice-space.org/ update VM’s XML profile under /etc/libvirt/qemu/ as suggested in second blog entry of Hans de Goede. Per Daniel Berrange: In the same way that SSH allows you to setup hostname aliases in $HOME/.ssh/config, libvirt will now allow you to setup URI aliases in $HOME/.libvirt/libvirt.conf (if you are running unprivileged) or /etc/libvirt/libvirt.conf (if you are running as root). 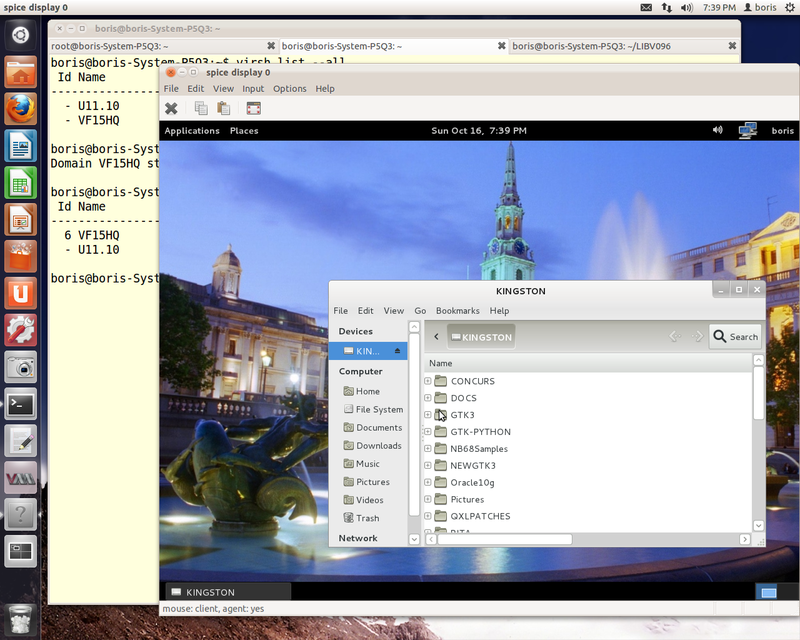 NB do not confuse this file with libvirtd.conf which is a server side libvirtd daemon config file. Due to spice upgrade users should be able to run Spice server on 32-bit OS (Precise daily builds). 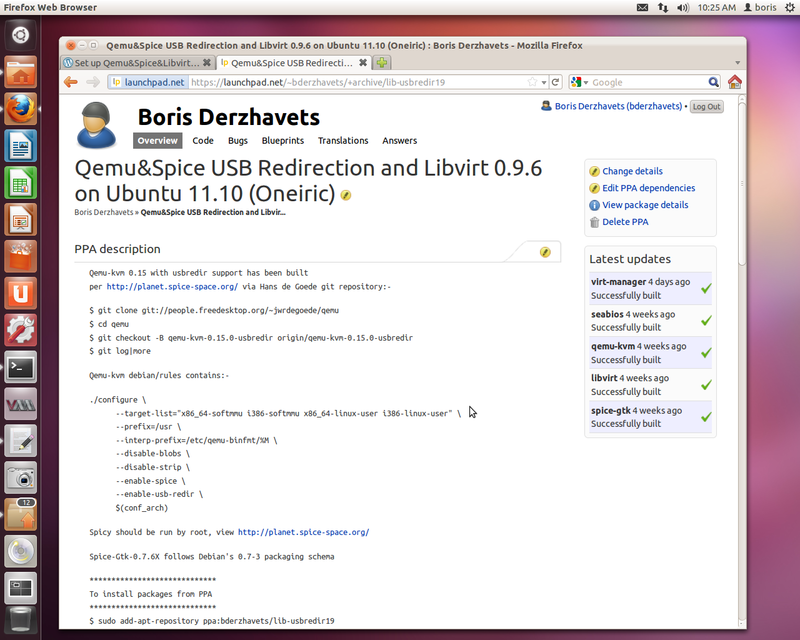 View also Qemu-kvm 0.15.1 & Spice(0.10.0) & Libvirt 0.9.7-2 USB Redirection support for Ubuntu Oneiric. Consider option downgrade seabios 1.6.3 => 0.6.2-qxl if some things go wrong for you. I’ve built locally and uploaded to Launchpad Libvirt 0.9.6 via Debian Unstable, applying standard set of Ubuntu’s patches updated for 0.9.6. Spice-Gtk-0.7.6X has been built up on current snapshot of git://anongit.freedesktop.org/spice/spice-gtk to obtain Spice-Gtk with usb redirection support working stable with Spice 0.9.1. 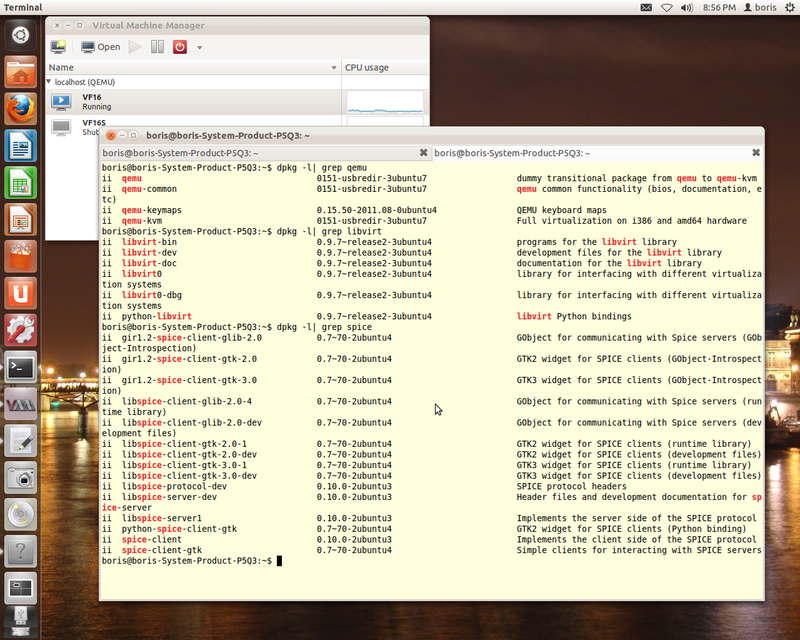 Build done on Ubuntu Oneiric.Packaged version version of Spice-Gtk-0.7.6X is built up on mentioned git repository. 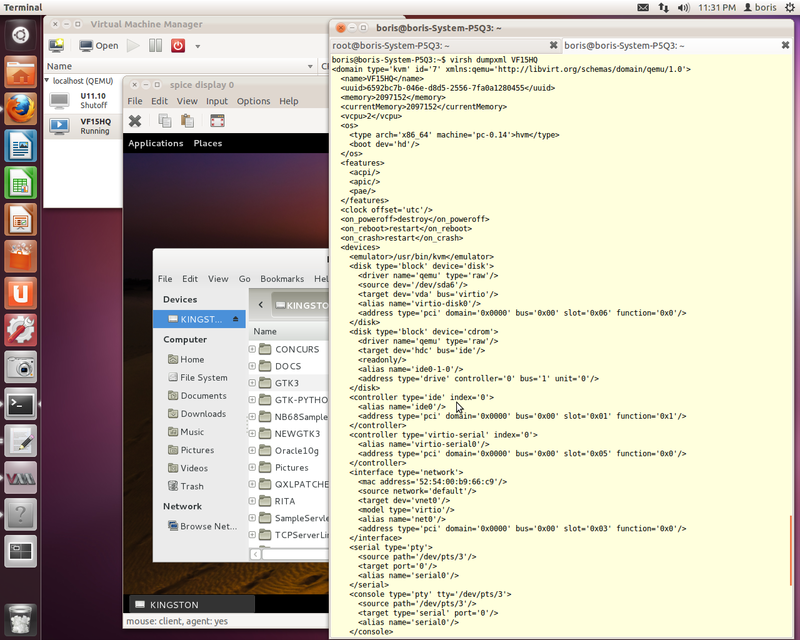 Running autogen.sh with exported environment variable NOCONFIGURE allows to perform it in one build per Debian’s Spice-Gtk-0.7-3 building schema, however requiring several updates to debian/control and debian/rules due to snapshots have to be done from current git tree. 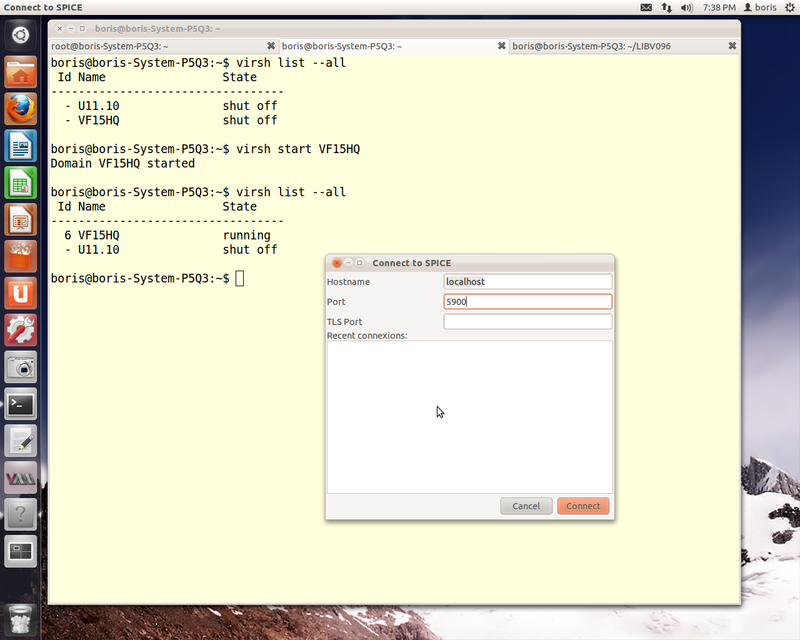 Manage VMs via virsh or Virt Manager having USB redirection support active in Spicy’s sessions. 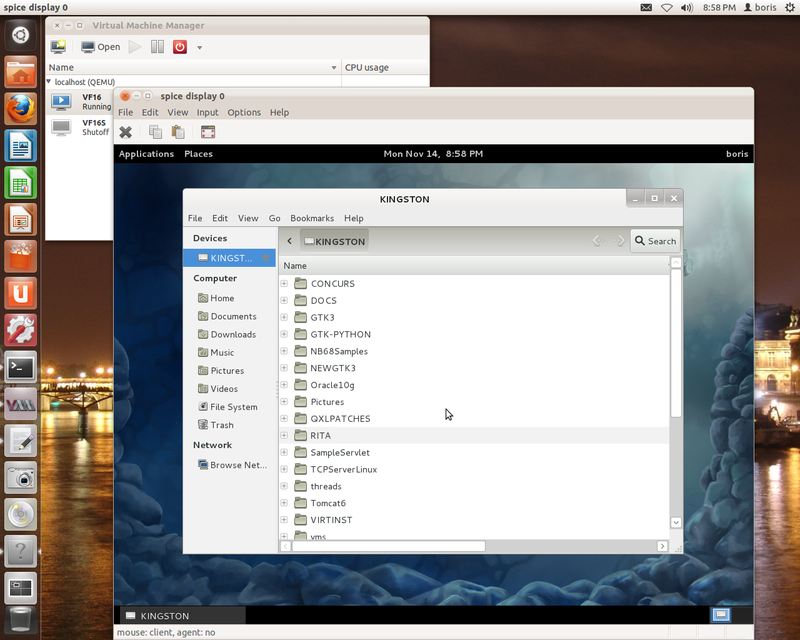 UPDATE on 11/14/2011 Issue fixed via upgrade Libvirt up to 0.9.7-2. That’s a link to PPA. Consider option downgrade seabios 1.6.3 => 0.6.2-qxl to get more or less stable F15 KVM guest behavior. It doesn’t help F16 RC1 KVM guest. You are currently browsing the archives for the Qemu-kvm 0.15.1&Spice 0.10.0&Spice-Gtk-0.7.81&Libvirt 0.9.7 on Ubuntu Precise category.